A POP retail display is a great way to command attention and position your brand ahead of competitors. Nescafé’s display uses multiple elements to stand out and encourage shoppers to try the product. Immediate: Immediacy is a major benefit of POP or POS displays. In Nescafé’s marketing campaign idea, promotional material is combined with the product itself. Customers are able to make their purchase while the advertisement is still fresh in their mind. A custom POP retail display can often result in impulse purchases, increasing sales. Attention grabbing: Nescafé’s pos display stand emphasises themselves ahead of the other coffee brands on the shelves. Elements at several different heights make up the POP retail display. As a result, this will catch the attention of customers at any eye level, whether from a distance or up-close. Customised: This is a great example of customising a display – and product – to better reach a specific target market. 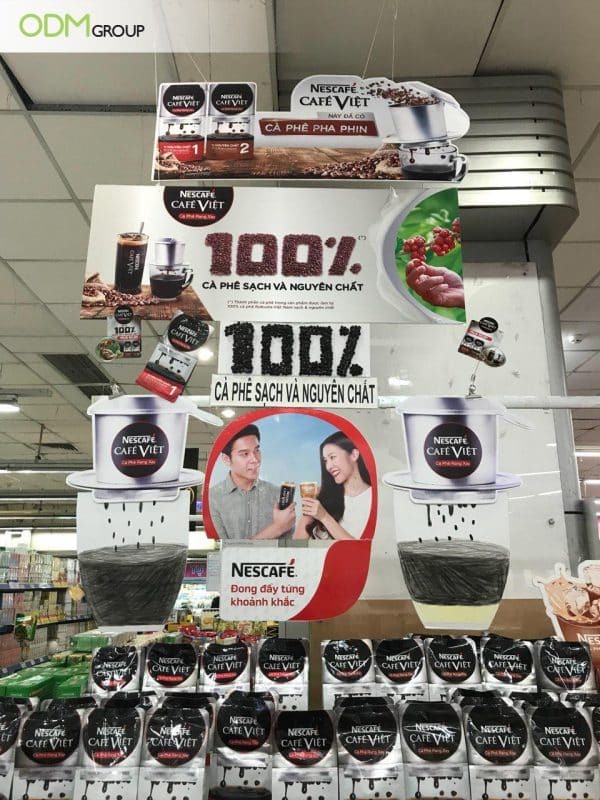 Nescafé’s Cafe Viet line is only sold in Vietnam as it is crafted in the sweeter style many Vietnamese people prefer. This demonstrates an awareness on Nescafés behalf of the unique needs of different target demographics, and a willingness to adjust products to satisfy these. Branded: This display represents Nescafé’s brand image well. The POP retail display uses a refined colour scheme of grey, brown and red shades, alongside a pop of green which stands out. Because this matches the colour used in the coffee’s packaging and in the long term, this will strengthen Nescafé’s brand recognition. Clear: The translation of Nescafé’s key message is “Coffee from 100% pure beans”. One sign even uses real coffee beans to spell out ‘100%’. The aroma of this alone is attention grabbing. In saying this, Nescafé may have benefited from simply displaying this message once in order to streamline the information presented. Why include a POP retail display in your marketing campaign? A POP retail display is generally placed next to the products the display is promoting. These displays are found either in the aisle which stocks the product or near the checkout area. Having a custom POP display in strategic locations where purchase decisions are made is a practical and cost-efficient way to set your brand apart from others. ODM has extensive experience developing and manufacturing high-quality POP retail displays, POS display units, and such as this. We are more than happy to offer our expertise and advice every step of the way. Feel free to send us your inquiry today! Kinder’s custom POP display, in the shape of the famous chocolate, is a great example of promotional material being well-matched to products. Laughing Cow’s unique display uses cheese products to make a farm house; a clever way of noting that the products are natural. Bottega’s attention grabbing POP display suggests a premium brand image. Jack Daniels’ display focuses on the premium qualities of the brand. Customers will be willing to pay more for the beverage as they connect it with luxury. Heineken’s retail display is tall enough that shoppers will notice it from any place in the store.